Hi, folks! 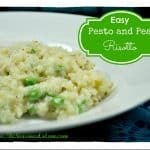 If you love risotto, but you don’t love standing at the stove continually stirring for long periods of time, then I have the recipe for you. 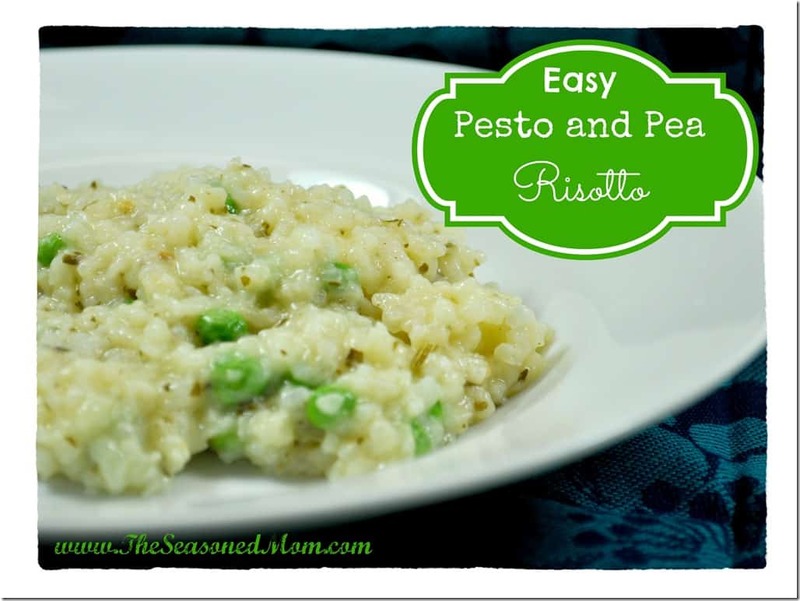 This Easy Pesto and Pea Risotto is exactly that: easy. You basically just dump the ingredients in the pot and let it cook in the oven for 45 minutes while you go about the rest of your business. In my case, that “business” was baths and pajamas for the kids, picking up Matchbox cars, corralling Thomas trains into their bins, and feeding the dogs. All while dinner sat baking in my oven! When it comes out of the oven, you dump in some more ingredients, give it a good stir, and dinner is served! Perfectly rich, creamy risotto, but without all of the work. This can be a filling vegetarian entree, a side dish with your favorite grilled fish or meat, or a complete one-pot-meal if you stir in some cooked chicken, shrimp, or salmon. Anyway you serve it, I promise your family will love it! Place rice and chicken stock in a Dutch oven (or other large, oven-safe pot), stir, and cover. Bake for 45 minutes, until most of the liquid is absorbed and rice is tender. Remove from the oven and stir in the butter, Parmesan cheese, pesto, and wine. Stir for 2-3 minutes, or until the rice is thick and creamy. Add salt, to taste. Stir in the peas until heated through. Serve immediately. Variations: stir in shredded, cooked chicken or grilled, chopped salmon along with the peas at the very end.